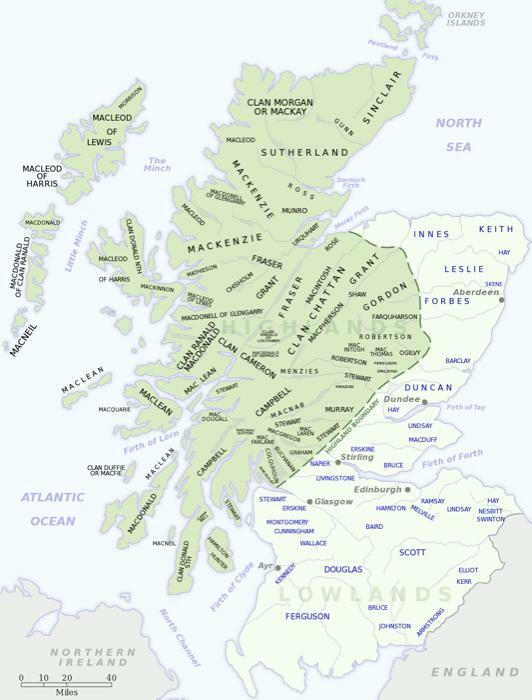 The Clan map of Scotland should be of particular interest to those of you who would like to know which part of Scotland your particular clan comes from originally, and where their lands are located. The clans normally identify themselves with lands that traditionally were controlled by their chiefs, and where often the ancestral castle or manor house would be situated. For any of you who wish to buy a clan map, simply contact me using the contact us page, and I will be delighted to give you some addresses. The borders between adjoining lands changed frequently over the centuries as clans fought wars to gain more and more land, which would then often be lost again in subsequent skirmishes. This was normal practice a few centuries ago as feuding families continued what were often petty squabbles from one generation to the next, it was to them a normal way of life. The graphic on this page is a modern day indication as to where the Clan lands are located, but cannot be guaranteed to be one hundred percent accurate. For further information on the historic locations of Clan territories please feel free to contact me via the "Contact Us" page, which you can find on the site's navigation bar.